Te Kupenga o Ngati Kuta and Patukeha ki Te Rawhiti have made a request to the Ministry for Primary Industries (MPI) for a further temporary closure at Maunganui Bay regarding the take of all fisheries resources, except kina. Written submissions in response to this request are invited from persons who have an interest in the species concerned or in the effects of fishing in the area concerned. A public notice calling for written submissions is in The Northern Advocate on Saturday 2 July 2016. 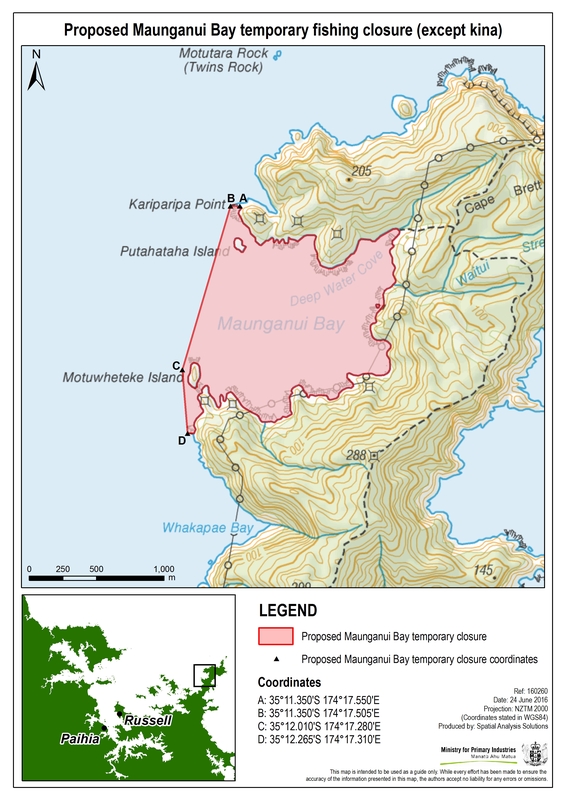 Pursuant to section 186A of the Fisheries Act 1996 (the Act), MPI has received a request from Te Kupenga o Ngati Kuta and Patukeha ki Te Rawhiti for a further 2-year temporary closure of Maunganui Bay to the take of all fisheries resources, except kina. The current temporary closure is due to expire on 29 October 2016.
recognising a customary fishing practice. Te Kupenga o Ngati Kuta and Patukeha ki Te Rawhiti consider that a further 2-year closure will provide continued statutory support for a customary rahui placed over the Bay in 2009, and allow continued enhancement of the local fisheries. The proposed temporary closure covers all that area of New Zealand fisheries waters enclosed by a line commencing at Kariparipa Point (35°11.350'S and 174°17.550'E); then proceeding in a straight line due west to a point at 35°11.350'S and 174°17.505'E; then proceeding in a straight line in a south westerly direction to a point off the western side of Motuwheteke Island (35°12.010'S and 174°17.280'E); then proceeding in a straight line in a south south-westerly direction to a point at 35°12.265'S and 174°17.310'E; then proceeding along the mean high-water mark to the point of commencement. The proposed temporary closure covers approximately 1.6 sq km. A detailed map of the proposed area is available, or email MPI for a copy – FMSubmissions@mpi.govt.nz. Email your feedback on the consultation document by 5pm Tuesday 2 August to FMSubmissions@mpi.govt.nz.